Down in Australia it was the Ironman Asia-Pacific Championship in Cairns at the weekend. As a championship race there are 75 Kona slots on offer to a comparatively small field of just over 1,100 athletes on the start line. 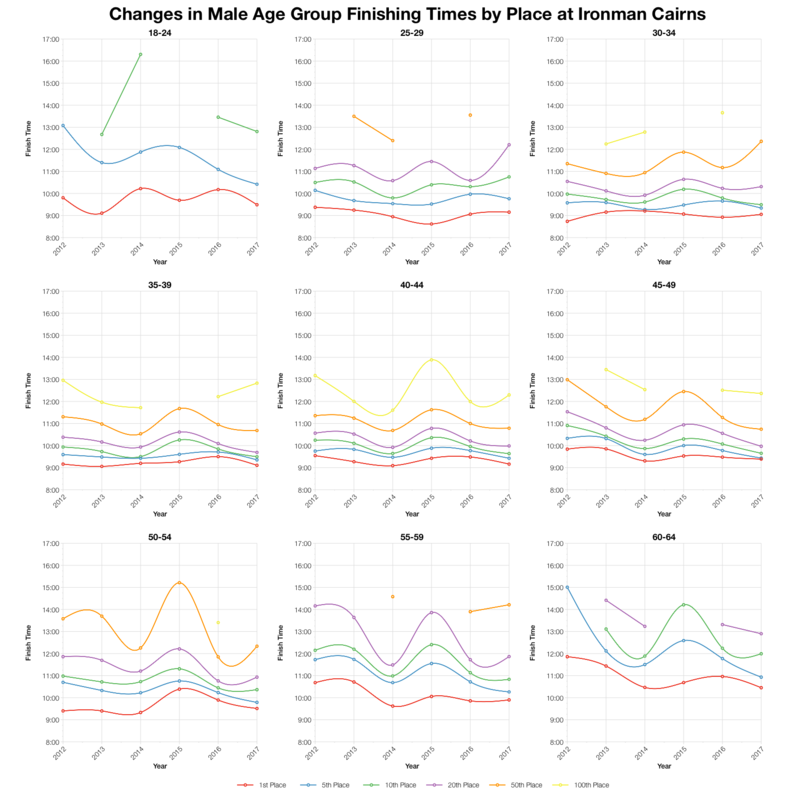 Overall this year’s race falls in line with previous results, but there were some particularly fast age group mixed in there. 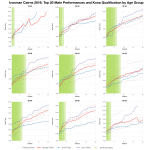 With the exception of the swim the 2017 race trends faster than the aggregate of previous results. 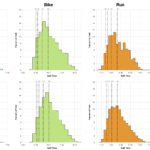 The impact is equal in both bike and run with a shift of around 5-10 minutes in each. That sums up to a 10-15 minute shift in overall splits. This year’s overall histogram is another broadly spread graph with more weight in the 13-14 hour region of its tail. DNF numbers appear to be middle of the road for this year’s race. I should make some notes on the 0% swim DNF/DNS rate as there’s a technical reason for this. If you are interested: I had to extract the Cairns results for a second time today as there appeared to be missing data from the set I’d collected on Monday. In that time Ironman had finalised the results pages removing split data and also classifying anyone who didn’t have a swim time as a DNS. As far as I can tell this is a sweeping adjustment and there’s no way for me to be certain if some of those athletes should actually be a DNF. It’s a minor point, but for that reason I just work from those athletes I’m sure started, i.e. those with a swim time. Checking over the median splits for individual age groups backs up the faster bike and run splits at this year’s race. 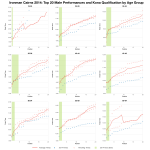 As ever when you subdivide the data it’s not universally true and for some of the smaller age groups there’s more variation in results. Overall most appear to be going faster though. The race attracts quite a broad spread of nationalities with 60% from Australia itself and the next largest nation being Japan. Kona slots are also spread fairly wide with Australia taking a portion similar to their entry side and Japan again taking second place here. 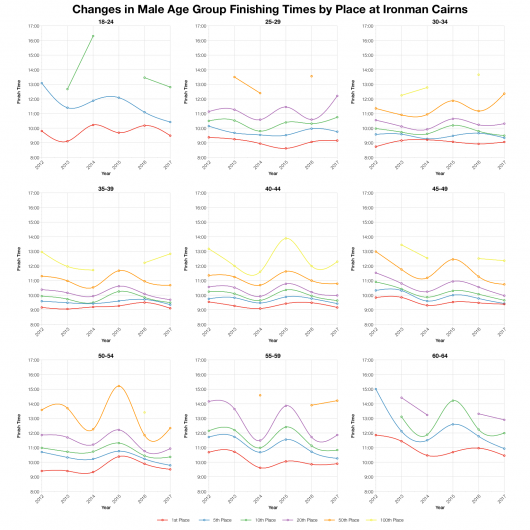 Tracking times for age group positions over the last six years of races does place 2017 as one of the faster years. It comes in quite close to 2014 a previous high point for the race. 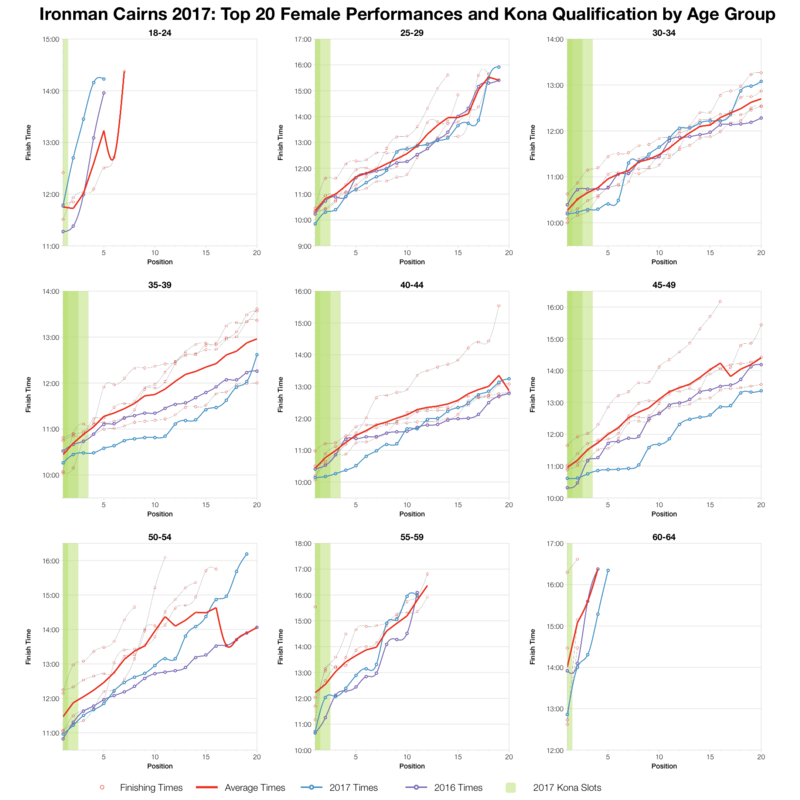 Based on athlete numbers I’ve estimated the Kona slot allocation for Cairns and from that the automatic qualifying time for each age group. Actual start numbers may vary slightly and roll down would also impact these times. You can find more information on qualifying times for all the Ironman races at my Kona qualification page. 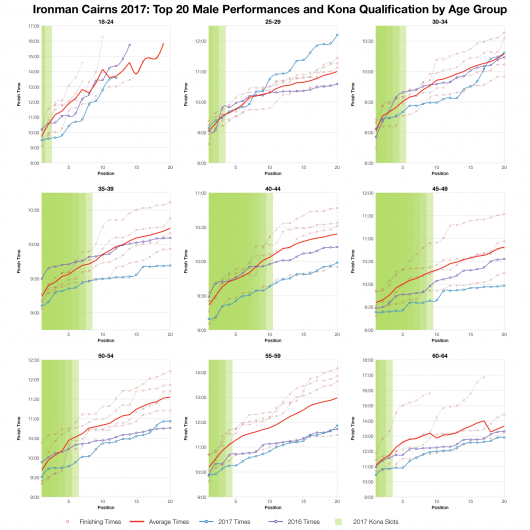 For the top twenty in each age groups times were clearly some of the fastest. 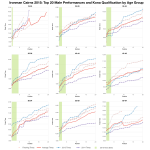 Again 2014 is the closest comparison as times are mostly ahead of the average. In some cases we see the fastest times for those places on this course, but for podium places times are fairly typical. 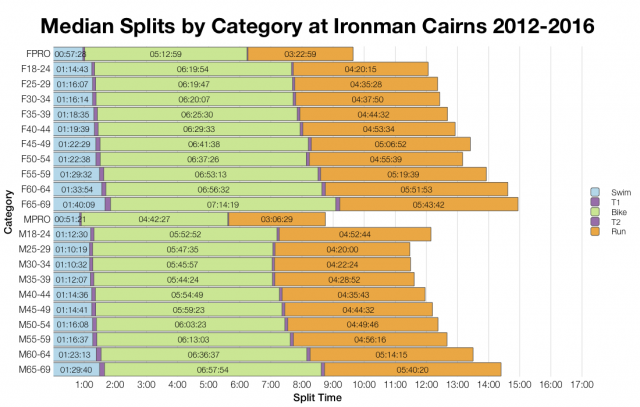 Clearly a fast year in Cairns. 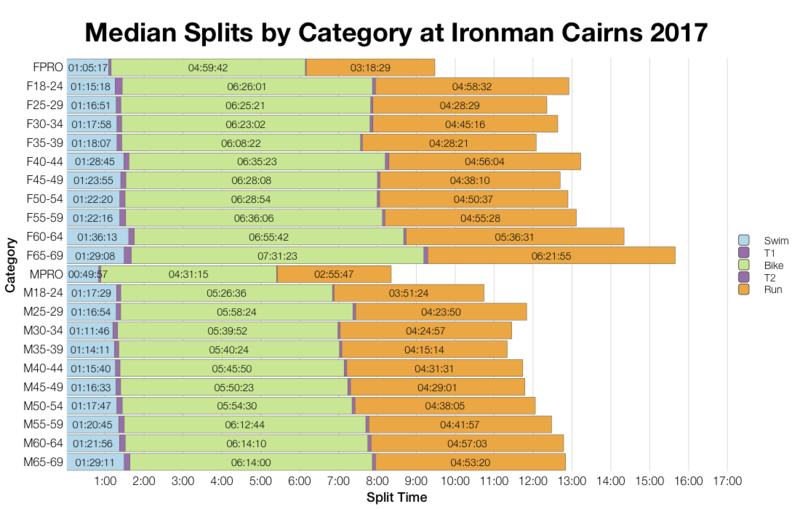 You can access a spreadsheet of the full results from Ironman Cairns 2017 on my Google Drive.